With no formal skills in business, Brother Ronald managed nevertheless, in a remarkably short period of time, to obtain funds for the first emergency shelter for homeless women in Wilmington. Next, he enlisted the help of committed religious orders and volunteers and on October 7, 1977, he opened the shelter which he named Mary Mother of Hope House. 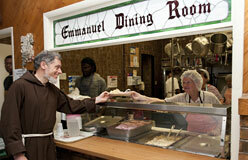 First dining room for the hungry in Wilmington, Delaware. Transitional housing for single women. Emergency shelter for homeless women with children. Employment and training service for the disadvantaged. Emergency shelter for homeless employable men. 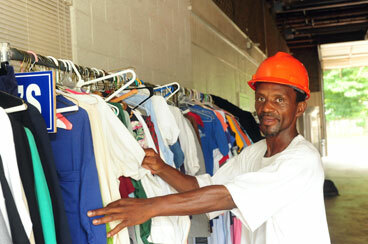 Program that provides free clothing, home supplies and furniture for people in need. Outreach partnership with St. Francis Hospital which takes health care services to the streets where Wilmington’s poor live. 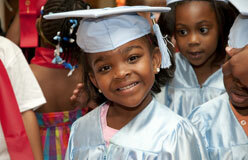 Child care and early learning for offspring of the poor, homeless and working poor. Housing for homeless women and children from the emergency shelters. Office that provides basic dental services for the poor. Outreach center that helps the poor and homeless with housing referrals, case management, hygienic services and support. Permanent residence for homeless people living with AIDS. Transitional housing that helps families. 78 one-bedroom, safe, afforable apartments for the elderly, with assistive services to enable them to live independently. Long-term housing for women with disabilities. Affordable infant care program for the poor, working poor and homeless. Long-term residence for single women. Long-term residence for men with disabilities. Named for the humble Nobel Peace Prize-winning missionary whom Ministry of Caring founder and executive director Brother Ronald Giannone, OFM Cap. had the privilege of meeting, opened in 2011 to bring affordable independent housing with supportive services to low-income men and women disabled by HIV/AIDS. Mother Teresa House Inc., a separate corporation, expands the service to persons living with AIDS by creating an independent housing component for those who do not require medical care. This program will work side-by-side with House of Joseph II. This historic residence will act as home-away-from-home for up to six recent college graduates who dedicate one year of service to the poor and hungry served by the Ministry. Expansion of Bethany House I, a long-term housing facility for women with disabilities. The Ministry of Caring today is an organization of 19 high-quality programs that serve the poor. With a current budget of over $10 million, the Ministry has accomplished much since 1977. Yet, much work remains. The poor of Wilmington will continue, no doubt, to demonstrate new needs. “Our success has been made one person at a time… one day at a time,” says Brother Ronald. With the support of staff, volunteers and donors, the Ministry of Caring will continue to help fill these unmet needs with your help.